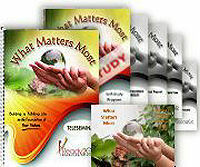 Teleseminar & Self-Study Coaching Program: What Matters Most - Building a Fulfilling Life on the Foundations of Your Values from Ready2Go Marketing Solutions, Inc.
To see a sample of the self-study coaching program, click here . Think for a moment about being on a boat in the middle of the ocean. With the sea stretching out before you, you could sail your boat in any direction you want. So which direction will you choose to take? A choice of direction may at first seem to have no real consequence, but over time that simple choice could have a huge impact. Big changes have their roots in seemingly small decisions. A two or three degree shift in direction may not seem to have much impact at the beginning of a journey, but miles into your journey the implications can be gargantuan. And that’s why identifying and understanding your core values is so important. Like the rudder of a boat, your core values are there to give you stability and guidance along your journey. 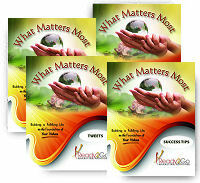 Values are your rudder that help you make decisions that will honor what matters most in all areas of your life. 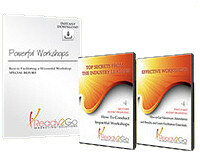 From this teleseminar your participants will discover how to identify the values that are guiding their lives. They will recognize how these values are continually influencing their life choices and the potential they have to better align with them to shape their futures in new and incredible ways. With the knowledge they gain from this training, they will become more conscious of their values and use them to sail in the best possible direction for their lives. Activity Objective: Participants discover what matters most to them under several different scenarios. Activity Objective: Participants define the term ‘values’ and explore the importance of knowing their values. They also discover the difference between the two types of values. Activity Objective: Participants see how their actions around money help them identify their core values. Activity Objective: Participants see how their actions around time help identify their core values. Activity Objective: Participants create their own personal value system. Activity Objective: Participants reflect on how they will further their awareness of their core values going forward.